Posted November 27, 2018 by finnfemme & filed under Fashion, Vintage. 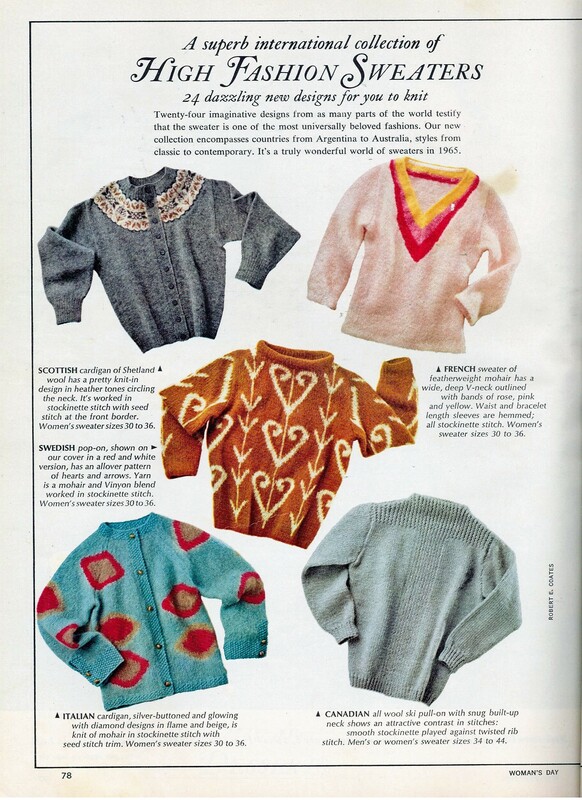 This February 1965 issue of Woman’s Day magazine – complete with ink doodles and stains – is a treasure trove of 24 high fashion international sweaters to knit. 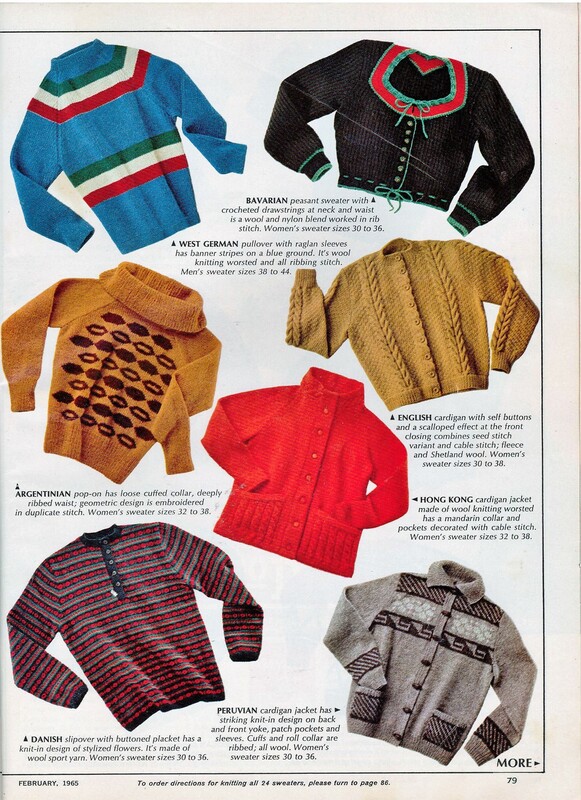 Alas, the knitting patterns were not printed in the magazine, but you could mail in a coupon and 50 cents to receive instructions for all 24 designs. 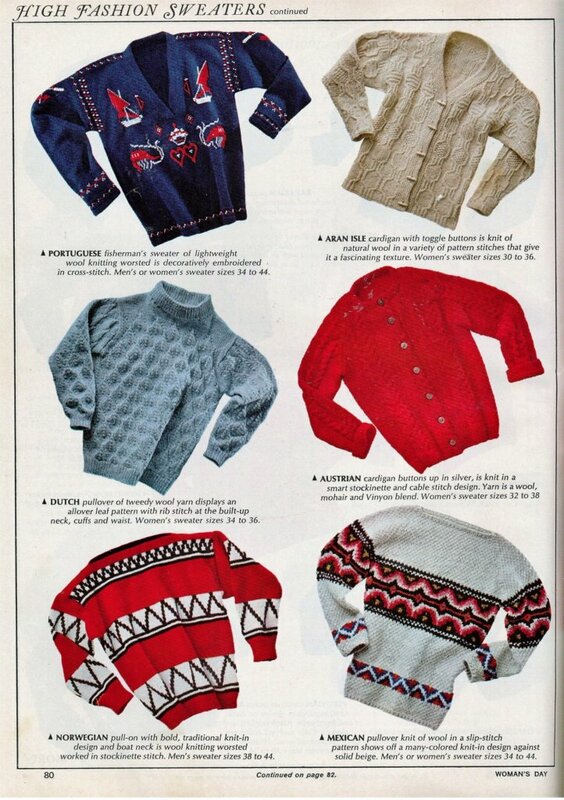 The sweaters are all truly beautiful and capture the essence of each country. SCOTTISH cardigan in Shetland wool has an intricate Fair Isle design. FRENCH sweater in featherweight mohair has deep V-neckline. 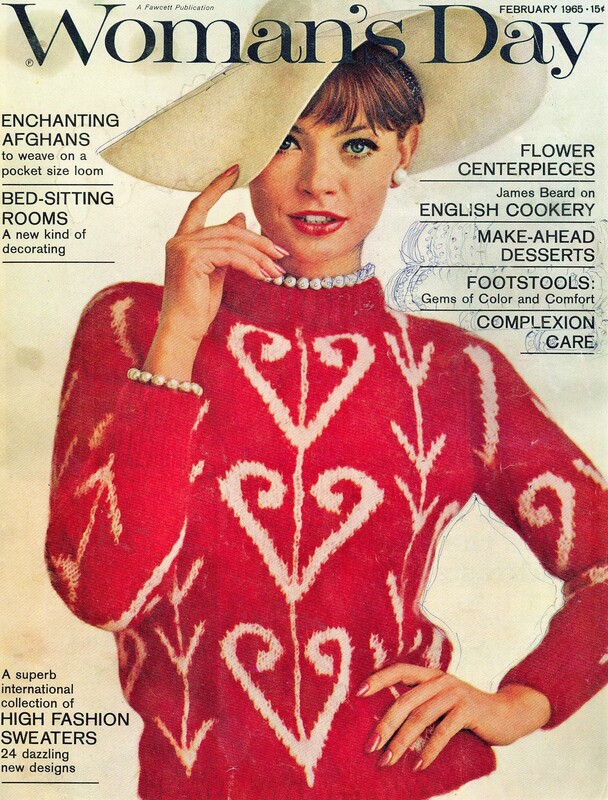 SWEDISH pop-on has design of hearts and arrows in a mohair blend. ITALIAN cardigan with diamond design is knit of mohair. CANADIAN all wool ski pullover with built-up neck shows an attractive contrast in stitches. WEST GERMAN wool pullover with raglan sleeves and banner stripes. BAVARIAN peasant sweater with crocheted drawstrings in wool. ARGENTINIAN geometric design pop-on has loose cuffed collar. 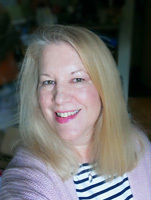 ENGLISH fleece and wool cardigan with scalloped effect combines seed stitch and cable stitch. HONG KONG wool cardigan jacket has a mandarin collar and pockets decorated with cable stitch. DANISH slipover with buttoned placket has a knit-in design of sylized flowers. PERUVIAN wool cardigan has striking knit-in design on back and front yoke. PORTUGUESE fisherman’s sweater of lightweight wool is decoratively embroidered in cross-stitch. ARAN ISLE natural wool cardigan is knit in a variety of pattern stitches that give it a fascinating texture. 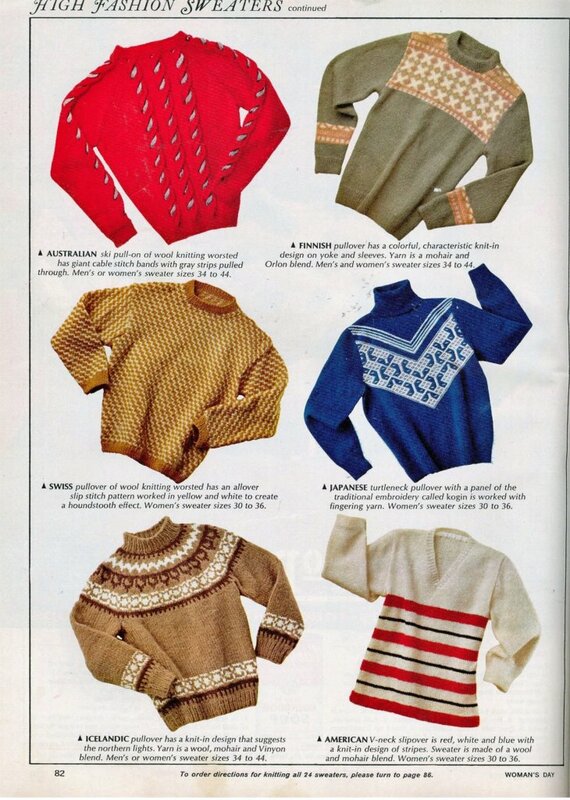 DUTCH pullover of tweedy wool yarn displays an allover leaf pattern. AUSTRIAN wool/mohair blend cardigan in a smart stockinette and cable stitch design. NORWEGIAN wool pull-on with bold, traditional knit-in design and boat neck. MEXICAN pullover knit of wool in a a slip-stitch pattern shows off a multicolored knit-in design against solid beige. AUSTRALIAN wool ski pull-on has giant cable stitch bands with gray stripes pulled through. FINNISH (Yay! 😀 ) mohair blend pullover has a characteristic knit-in design on yoke and sleeves. SWISS wool pullover has allover pattern in yellow and white to create a houndstooth effect. JAPANESE turtleneck pullover with a panel of traditional kogin embroidery. ICELANDIC wool/mohair pullover has a knit-in design that suggests the northern lights. AMERICAN V-neck slipover is red, white and blue with a knit-in design of stripes. Sweater is made of a wool and mohair blend.